Only Parent Chronicles: Today's the Day! Since joining the SITS Community over a year ago, I have been anxiously awaiting the day I received an email saying it was my turn. Saturday the waiting ended. I was visiting Fave Cousin in Illinois when the email came in. It was last minute, but I was over the moon! Today, it is MY day! What is SITS, you might ask? 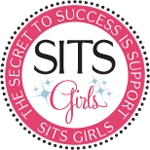 SITS is a community of over 8000 women bloggers dedicated to supporting one another through comments! For those of you visiting Only Parent Chronicles for the first time, welcome to my little slice of sanity! Come on in! Take a look around! I love having new visitors! I hope you enjoy yourself! Contrary to my title, this blog isn't all about parenting alone. Within this space you will find an honest approach to life in general. In addition to exploring the world of parenting solo, Only Parent Chronicles has become a journey of self-discovery, acceptance of the world around me, and a tongue in cheek approach to the things I enjoy. Every Tuesday, you can join me and many others for Post-It Note Tuesday. This link-up allows all joiners to express their thoughts for the day in Post-Its. I have at times attempted fiction, and I frequently discuss the trials of raising a special needs child. I have also recently defined the Ten Commandments of Me. I truly believe there is something for everyone here at Only Parent Chronicles. I thank you from the bottom of my heart for stopping by. And if you are a first timer, I really hope to see you again! Been taking a look around and getting to know you and your journey! All you've been through and are currently going through! Blessings to you! And saying a prayer for you today! Happy SITS day! Congratulations on your special SITS day today! :) You rock! I'm a single mom of two as well. I'm off to work this morning, but will be back to check out more soon! Yay! Congrats on your SITS day! I discovered your blog last week and I love it! Congratulations on your SITS Day! Did I see a little Wisconsin pride in one of your pictures? Enjoy the comment love today. Oh yay!! Happy SITS Day! It's really exciting and I'm so happy for you. Enjoy the bloggy lovin'!!! Waaah! So excited that today is your SITS day! Love that your blog makeover was done in time for company. Enjoy your day! Happy SITS Day! Off to check out some more of your blog. Being an only parent is rough! I know- very well. I have 4 preemies and 1 special needs child so I am right there with you. drop me an email if you ever want to chat! Happy SITS day! You sound like quite an amazing person. Thanks for sharing your blog with us. Happy sits day! Recommending your blog to a friend who is only parenting as well, glad to find your blog. Happy SITS day!! I am enjoying reading your older posts already!! Wow. I just got done reading your post about bringing your baby boy home. You are an amazing woman! I can't wait to read more. I'm hooked! Happy SITS day! I hope you enjoy your day in the spotlight! Off to look around! Blogging at its best when an amazing woman is willing to share her personal story!!! I am very excited that your SITS day finally arrived!!! Congratulations, and I'm glad to meet you finally :) I followed your blog! I'm off now to read through your blog! Hope to see lots more of you, now that we've met! Happy SITS day! New follower and would love if you would follow me back! Happy SITS day and thank you for sharing your amazing and inspirational story! Wow, what a story. I cannot imagine going through everything you've been through and enduring it with sanity still in tact, but I do believe that God will use things in our lives for good if we will allow Him to (you alluded to not believing in God at the time, which seems to imply that you do now :) ). I hope you have a wonderful SITS day! Congrats on your SITS Day! I really love your blog and can't wait to visit, again! You are such an inspiration! I'm now a follower! Congrats on your SITS Day! I love your header, it's so pretty! Congrats, bask in the glory! Happy SITS Day! Love, love your blog -- can't wait to read more of your trials and tribulations -- so inspiring on the challenges you've overcome. Happy SITS day. I've seen the Post-It Tuesdays around and have loved them. Happy SITS day! Looking forward to reading your fiction. Do you still write? a big happy SITS day to you sweet bella, looking so forward to reading more, have a glorious week! happy feature day! Glad I stopped in to check out your blog. I love how your dad inspired you and pointed out that you have become a better person through tough times. I agree! I hope you had a great SITS day, Kristin!! Happy SITS day! Glad it finally came for you. Your blog looks interesting. Congrats on your day!! How thrilling. I was a single parent of foster kids for a few years and would have loved to have a place to visit with insights, etc. at that time. I wasn't an only parent because all my kids had biological parents but I very much parented alone most of the time. So very glad parents have resources like this. would love to "see" you!! Also forgot to say I love the look of your site...awesome!! Happy SITS day. I've already begun reading your story. I can't wait to go and start reading your story. Happy SITS day! I'm so glad I came by. You have a fantastic blog. I also have a special needs child and will be a repeat visitor here for sure! Happy SITS day! Can't wait to take a peak around. HAPPY SITS DAY!!! I stopped in to congratulate you and of course I was nosy I had to read your story....all of it....Parts 1-random questions. WOW! Thank you for sharing you. I'm definitely glad I came by. You are incredibly strong and I look forward to definitely reading more from you. Happy sits day! I am excited to look around and read more of you exciting experiences. Hope you're enjoying your moment in the SITS sun! Love the look of your blog - and the strength behind your story. Amazing. Happy Happy Joy Joy! Wonder Triplet Powers Activated and you got your SITS day! Can't be coincidence. We are powerful! Bwahahaha! Love you! Your blog sounds really wonderful! Thank you so much for sharing your story and helping and encouraging others. I love that you were inspired by your Dad. I can't wait to read more of your story and your journey! Happy SITS day boo, damn it's cute up in here! I'm so glad to have found you! Happy SITS Day! Congrats! Looking forward to looking around! I don't get SITS anymore, their new site has too much going on... I never know where to comment. Maybe it's just me, LOL! Yay! Im SO happy for you. =) Hope your SITS day was amazing! YAY!!! Congratulations on your SITS day!! I hope you had a blast!! Woot Woot Woot !!! Happy SITS day!! I was so excited when I saw you were the feature!! Congrats on your SITS day! =D I'm days behind... but it's better late than never, right? hahaha.. Sorry I missed your SITS day, I was attending the birth of my second grandchild. I love your 10 commandments ... it's great to define your non-negotiables. And your post about someone telling you "you're horrible" broke my heart. We raised a child with ADD and there were times when one or both of us just had to get away. I feel fortunate that we at least had each other to offer occasional relief. I hope your SITS day was fabulous. Sorry I am a little late in congratulating you! I was just browsing over your Future EX section...I love it! !